Big Government is invading your privacy, is seizing your lands and taking your money. Big Government, whether it be Federal, State, or Local, are constantly and consistently infringing upon the rights of Citizens and for the most part, the citizens are powerless to do anything about it. What concerns me is how did we let it get to this point, and why are we not doing anything about it? In my last blog article I reported on the incident in Nevada and the Bureau of Land Management land grab, specifically with regards to lands utilized since 1870 by the Bundy Family. As it turns out, this was the tip of the iceberg. As reported, the Cliven Bundy incident was a major show of force by the U.S. Government, specifically the Bureau of Land Management, to seize a large tract of land that had been used by the Bundy Family since 1870. There were those who took me to task, stating Bundy was wrong because a Federal Court said he was wrong. The question being, did the Federal Government and the Federal Court have jurisdiction, a detail yet to be determined. In other words, what right does the Federal Government have to claim land that belongs to an individual or to a state? The U.S. Constitution limits the power of the Federal Government in acquiring lands, and the specific uses of those lands it does acquire. Article I, Section 8 of the U.S. Constitution states “To exercise exclusive Legislation in all Cases whatsoever, over such District (not exceeding ten Miles square) as may, by Cession of particular States, and the Acceptance of Congress, become the Seat of the Government of the United States, and to exercise like Authority over all Places purchased by the Consent of the Legislature of the State in which the Same shall be, for the Erection of Forts, Magazines, Arsenals, dock-Yards, and other needful Buildings; “. It doesn’t say anything about turtles and it does not say anything about lining Harry Reid’s pocket. Based on this, the land in Nevada, the land along the Red River in Texas, and other federal land grabs are in violation of the U.S. Constitution. The problem is, unless the affected states are willing to take a stand on behalf of their Citizens, the Federal Government is always going to win. This seems to be the case in Texas with regards to the Red River land grab, but in Nevada, not so much. State Governments are reluctant to take a stand against the Federal Government because the federal Government will withhold funds for infrastructure such as roads and bridges if the States do not toe the line. Somewhere along the ay the Federal Government became the big cheese. If I remember my Civics lessons, originally the Federal Government was subservient to the States, based on a majority vote. Now the hierarchy has changed and the States are subservient to the Federal Government. And that is a bad thing. So what can be done about it? That is a difficult question to answer. The courts do not seem to be the answer as the courts are biased toward the government that appointed them. And even it they are not, the Government has the deep pockets and can out spend and out last an individual citizen. Taking a stand via small acts of civil disobedience might work, but is just as likely to get one thrown in jail. The power of the vote? Not likely since the people we elect are usually a part of the problem, not a part of a solution. I don’t have an answer. I just know it has gotten bad. Something needs to change. I will keep thinking about it. Answer: The states have the authority to call a constitutional convention and amend the constitution. They also have the power to impeach Obummer and federal judges as well as Supreme Court judges. They can abolish the Department of education and fire all the people in the rest of the beauracracies. 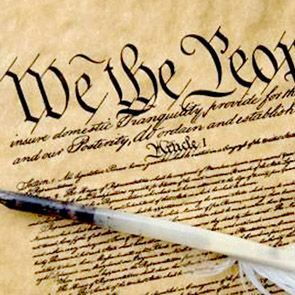 Make an amendment that all government employees, Congress and Senate, must also be included in any law enacted on the people and in like manner. And on and on and on.